“The Heart of Betrayal” continues to follow Lia, Rafe, and Kaden as they are now in Venda, Kaden’s homeland. Lia and Rafe are both prisoners, but as things begin to unfold in Venda, more lies are starting to trickle their way into their lives. This sequel is definitely riveting and it includes more heart-pumping, jaw dropping events that are sure to make fans of the first book crave more. This sequel was slow to start out, but it quickly grew and built into a fantastic installation that had me craving more and wanting to find out what happened next. As this is a sequel, there will probably be spoilers ahead. Lia is becoming a lot stronger in this book. She had just gone through hell and back with her emotions and to then be thrust into a world where she believed only cruel barbarians lived was just the icing on the cake. She quickly learns, though, that she can’t let any weaknesses show lest the Komizar play with those weaknesses. I thought that she did her best trying to grasp not only the concept of what it was like to live in Venda, but what it was like to be a strong, independent person. She couldn’t rely on anyone but herself to get her through to the next day, let alone the next moment. She did find confidences here and there in some people, but in others she knew she couldn’t trust them. I felt that she grew throughout the book, but she also definitely let her heart lead sometimes instead of using her head. At times she did act stupidly and some of her thought processes made me mad, but I understood that she was raised to believe a certain way, and the fact that she’s opening up to this new way is actually refreshing. Rafe kind of grew on me a little more in this book. I thought that he wasn’t so arrogant in this sequel and that he was definitely not only the prince – and a skilled liar – but that he was a warrior and that his first instincts were to protect those he cared for – namely Lia. I thought that he was kind of slopping at times, his temper and emotions leading him into near consequence, but he had help one way or another to remind him that this wasn’t a land he could stand out in; he needed to play the part he set out to play, and that was all he could do. I didn’t appreciate some of the lies that he weaved throughout the book, with or without Lia, but I knew that was part of how they’d have to eventually escape. Kaden, I think, was caught between a rock and a hard place when they reentered Venda. His loyalties to his country and the Komizar run so deep that sometimes I thought he’d abandon Lia for stupid reasons, but I think that as his feelings for Lia continued to grow his loyalties were tested. He showed more of his true self, of the wounded boy he once was and the strong Assassin he had to be. I totally felt for him on a deep level because, well, I love him, and I think that he’s just one of those people that grew up too hard and too fast. Yes, he acted impulsively and rudely sometimes, but I knew that he also had a part to play if he wanted to keep not only Lia, but Rafe, alive (even if he wanted to kill Rafe with his own two hands, he did it for Lia). The Komizar was the newest character introduced and boy oh boy, did I not like him. I thought he played the part of the vicious, cruel leader well, holding himself on a high pedestal and wanting all the power and control for himself. He had a few tender moments, but they were all just a game he was playing with Lia and the others. He seemed always to be a step or two ahead of everyone and it made for an interesting story for sure. I wasn’t sure how it would end with him because of his cunning, but he got what he deserved, suffice it to say. We even got a few chapters with Pauline as our main girl and I really missed her. She’s so kind and innocent and I love how her faith in Lia never falters. I think that doubt does creep in, though, toward the end, but I’m wondering what will happen in the next book and whether or not her loyalties and faith with still remain with her best and closest friend. Now as for the plot, I did think that it was a bit slow at times and I was unsure of where it was actually going. I did appreciate the glimpses of Lia’s gift here and there and that we got to see it more developed than before. I’m hoping more will come in the next book. In terms of the main plot, there were a lot of loose ends to either tie up or continue to draw on and I thought that it was executed really well, especially in the second half of the book. We got to see political drama, an army beyond imagining, the world of Venda and its people, and so much more. I really had a lot of emotions in this book that made me feel for the characters, making me want to keep them close and take care of them – or strangle them. There were many parts where my jaw dropped open or where I rolled my eyes or sighed with relief. Anyway, I give this book a 4.5/5 stars and highly recommend it! 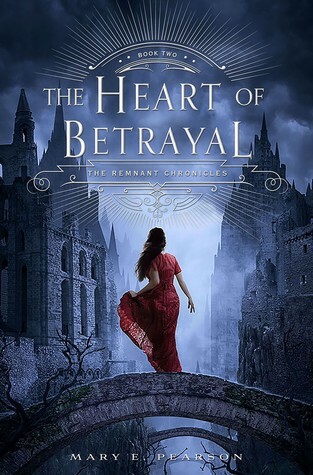 This entry was posted in Book Review and tagged 4.5 stars, book, fantasy, mary e pearson, read, reading, review, romance, sequel, the heart of betrayal, the remnant chronicles, ya, young adult. Bookmark the permalink.